Westward Ho! is distinctly special due to the features that form its landscape. Away from the busy seafront town, this becomes more apparent. A short climb to the top of Kipling Tors reveals spectacular coastal views, but it's Westward Ho! 's golden sands that steal the show. Stretching for nearly two miles, gently sloping toward the sea, the beach is perfect for all sorts of family fun. It's also popular with surfers, kite surfers and wind surfers. And it's more recently become a big hit with kite buggy enthusiasts too. The beach is backed by Westward Ho! 's famous Pebble Ridge, which provides protection from the Atlantic for Northam Burrows, another of Westward Ho! 's much loved features. The Burrows are a great place for a walk. Here you'll find The Pill, the channel that provides drainage for this flat coastal landscape. Without it, exploring this area would be impossible. You'll also find the oldest golf club in England and Wales here (and the first club which allowed female members), The Royal North Devon Golf Club. It was founded in 1864 and is still open today. This is a nationally renowned ‘links' course, one which uses natural landform features and natural grasses. Effective management of Northam Burrows helps to maintain this wonderful and precious habitat. Fantastic flora and fauna flourish here. A short stroll will bring you to the Skern, an intertidal salt marsh. It's home to all sorts of bird and wild life and is internationally recognised for its biodiversity. Wading birds are especially fond of the Skern and it's visited by several species, from Golden Plovers and Brent Geese to Wheat ears and Skylarks. Best take your binoculars. Non-intensive farming of Northam Burrows has also allowed rare plant life to thrive: the Pyramidal Orchid, Strawberry Clove, Scarlet Pimpernel, Evening Primrose and Hen Bane are just a few of the seldom seen species you can spot. You will also find the locally distinctive Sharp Rush among the grass too, which has the reputation of being sharp enough to pierce a golf ball! And if you visit between May and August you'll be able to refresh your senses as the fragrances of wild thyme and mint fill the air. These can all be spotted in the fenced 8 acre area next to the Northam Burrows Country Park. Many of these special habitats are recognised nationally, coming under the protection of SSSI's (Sites of Special Scientific Interest) and CWS's (County Wildlife Sites). Geologists and geology enthusiasts love Westward Ho! because it's defining feature, the Pebble Ridge, gives a unique insight into the workings of longshore drift. The ridge is made from rounded cobbles, of rock formed during the Upper Carboniferous period. This layer of rock can still be seen as a clearly defined layer in the Westward Ho! 's cliffs. The rock layer and therefore the cobbles, smoothed round by the action of the sea, are a staggering 300 million years old! Westward Ho! is a popular seaside resort near Bideford, developed by the Victorians to satisfy their love of the English seaside. They named the village after the 1855 novel of the same name by Charles Kingsley, a prolific author from the region. 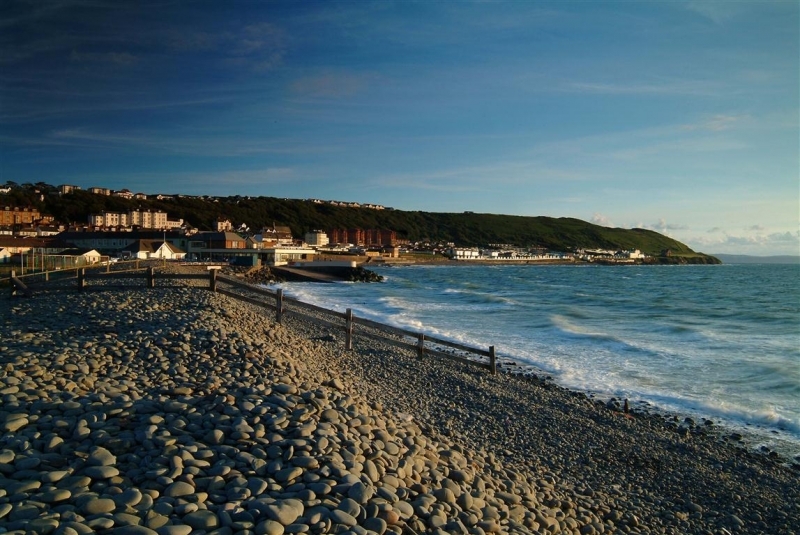 It's a village renowned for its name and coastal landscape, but there's more to Westward Ho! than peculiar punctuation and pebbles. The area around Westward Ho! has a compelling history. WWII anti-tank defences can still be seen on the beach, which was also used to train troops for the Normandy landings. Then there's the prehistoric forest underneath the beach - preserved by intertidal muds. Best time to see this is at the lowest spring tide (equinox tide, in March and September), when the ancient roots can be seen sticking up through the sand. It's an incredible sight. And so is the shipwreck of The Sally, which ran ashore in 1769. The original oak rafters of the boat still poke out of the beach at low tide. There's plenty you can explore inland too, like Bloody Corner, between Appledore and Northam. Look in the hedgerow and you'll see a stone tablet commemorating the place where, allegedly, King Alfred The Great slayed the Viking leader Hubba The Dane after the Vikings attacked North Devon in the 9th Century. There are also a number of lime kilns along this coast. Limestone was shipped across the Bristol Channel from South Wales and after being burnt in the kilns was spread over the fields to fertilise the soil. There are also remains of an old railway line which can be seen near the beach huts. This unusual line operated for a relatively short time, between 1901 and 1917. From Bideford it headed due west to meet the coast, then continued along the cliffs to Westward Ho! and on to it's terminus at Appledore. In Bideford it ran on rails in the road along the Quay and the trains were fitted with ‘cow catchers' and side plates to prevent pedestrians being run over! Just inland from Westward Ho! is the pretty village of Abbotsham. A walk along the open landscape of the Abbotsham Cliffs will reveal amazing views over Bideford Bay and out towards Lundy. The village of Northam, meanwhile, has evidence of prehistoric settlements as well as a rich Saxon heritage. Then there's Appledore, a maritime village with an important history in shipbuilding that still survives today. Set in a beautiful estuary location with stunning views across to Instow and Crow Point, it is well worth exploring. The village is home to the Appledore Maritime Museum, and also to the Appledore Arts Festival in mid summer most years, and the Appledore Book Festivalin September. A small railway used to connect these villages to Bideford. The railway mainly transported holiday makers around the coast and was only in operation for a short time, between 1901 and 1917. Most of it has long disappeared but you can still walk some of the old railway trackbed from Westward Ho! towards the cliffs at Abbotsham. How about exploring the rock pools on the beach? They're full of life and are great for exploring with kids. You might even spot a basking shark off the coast. In 2003 one washed up on the beach and rumoured to have been later sold at auction for $17 million dollars after it was pickled by the famous artist Damien Hurst. Its arrival on the beach was unexpected, but basking sharks are at home off the North Devon coast in the summer months. No need to worry, though. They're harmless. Westward Ho! is a delight for walkers and cyclists. The Tarka Trail, North Devon's traffic-free cycleway, is nearby whilst the South West Coast Path will take you through the heart of the village and onto Kipling Tors before heading west to Hartland along the old railway. From here you can enjoy panoramic views of Northam Burrows and the Taw & Torridge estuary - a must if you're a fan of the great outdoors. The Tors are owned by The National Trust and are named after Rudyard Kipling, who attended the United Services College in Westward Ho! Of course if you want to find out a little more, you can always take a guided walk across Northam Burrows. They are organised throughout the summer and are suitable for all walking abilities. Whether you fancy getting arty at Appledore Arts Festival and the International Book Festival, or making a splash at the Appledore and Instow Regatta, you'll find an event that suits you perfectly here. Feeling floral? Visit the Abbotsham Flower Festival at the end of July and thrill your senses. Visit Westward Ho! at the end of August and watch more than 300 classic Minis leave the village on North Devon Mini Register's annual cruise to Victoria Park in Bideford. Another highlight is the legendary Potwalloping Festival that takes place in Westward Ho! every May. This tradition dates back to the late 1800s when, in return for permission to use the land behind the pebble ridge, farmers would replace pebbles lost from the ridge to protect the land from the sea. The tradition continues today, albeit with more revelry and live music, and was recently listed in The Telegraph's Top 100 UK Festivals.